An alternate way to set up the DST pool cluster resource is to cluster-enable the primary pool, then create a shared pool that is not cluster-enabled as the secondary location. You manually modify the primary cluster pool resource scripts with the commands needed to load and unload the secondary pool and volume. The primary pool cluster resource manages the two pools and volumes. The NCP Server object’s name for the secondary volume keeps the hostname of the node where it was created. A static IP address is not consumed for the secondary pool. The secondary pool and volume are shared but not clustered. This can be useful in a migration scenario to move data to a secondary volume and move the volume to a different node. After you remove the shadow relationship, you mark the secondary pool’s device as Not Shareable for Clustering to unshare the pool and volume, then use the Update eDirectory option in NSSMU to create storage objects with the new hostname. There are no Cluster objects to clean up. You must manually enter the lines of code in the primary pool cluster resource’s load, unload, and monitor scripts for the secondary pool. The option to create a pool on a shared device without cluster-enabling it is available only in NSSMU. You cannot use the Storage plug-in in iManager. To later use the secondary pool as an independent cluster resource requires a some extra steps. Use the Update eDirectory option in NSSMU to create storage objects with the new hostname, then cluster-enable the pool by using the Clusters plug-in in iManager. IMPORTANT:After you modify the primary pool cluster resource, you use the resource to manage the secondary pool and volume. Use the information in the following sections to set up the DST pool cluster resource. For this method, you need two NSS volumes: one in a clustered-enabled pool and one in a pool that is shared, but not cluster-enabled. For instructions for creating the cluster-enabled pool and the primary NSS volume, see Configuring and Managing Cluster Resources for Shared NSS Pools and Volumes in the OES 2015 SP1: Novell Cluster Services for Linux Administration Guide. To create the secondary shared pool, see Section 15.5.3, Creating a Shared Pool and Volume that Are Not Cluster-Enabled. The cluster load scripts elsewhere in this section assume the following setup for NSS volumes in the clustered DST volume pair. Ensure that you use the actual information from your setup. You use the IP address for the primary pool’s cluster resource for the shadow volume. When the primary volume has a state of Shadowed, its NCP volume ID represents the DST shadow volume pair of volumes. A separate NCP volume ID is not assigned to the secondary volume while the volume is in the shadow volume relationship. You use only the ID on the primary volume in the ncpcon mount command in the cluster resource load script. IMPORTANT:In the cluster load and unload scripts, the add_secondary_ipaddress and del_secondary_ipaddress commands refer to the cluster resource’s IP address that is “secondary” to the node’s actual IP address. It is not related to the DST volume’s terminology. After you create a clustered pool, view the scripts. If the cluster is not in your customized list, you can add it now. Click Add, browse to select the cluster, then click OK.
On the Cluster Manager page, click the Name link of the primary cluster resource to go to the Cluster Pool Properties page, then click the Scripts tab view the load, unload, and monitor scripts. The following table provides sample load, unload, and monitor scripts for the POOL1-SERVER resource for the primary clustered pool named POOL1. Novell CIFS can be configured as an advertising protocol when you set up the primary cluster pool. 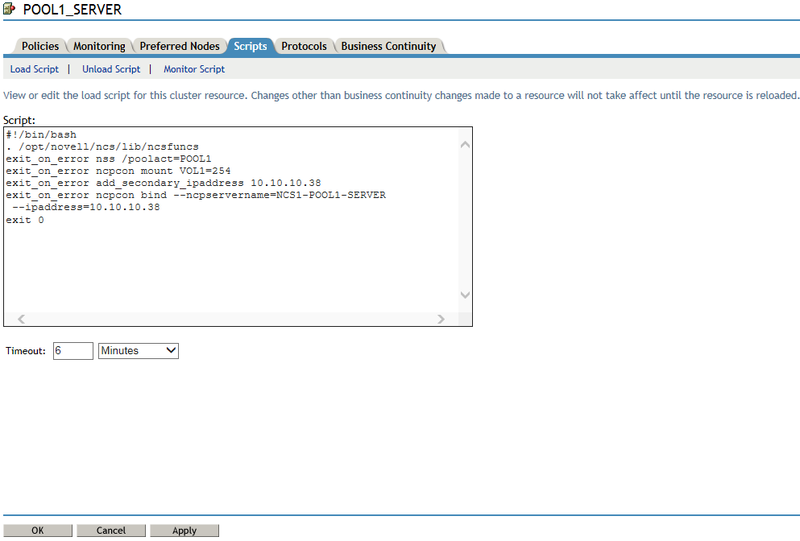 At the bottom of the Scripts page, click Cancel to return to the Cluster Manager page. Continue with Section 15.5.3, Creating a Shared Pool and Volume that Are Not Cluster-Enabled. On the server where the primary pool cluster resource is assigned, log in as the root user. Open a terminal console, and enter nssmu to open the NSS Management Utility. From the NSSMU main menu, select Devices to go to the Device Management page. Ensure that the device you want to use as the secondary location is available but is not currently shared. Do not mark the device as shareable at this time. If devices are present but not showing up for creating pools and volumes, you should initialize the disk. From the NSSMU main menu, select Pools to go to the Pools Management page. Create a pool on the device. Because the device is not yet shared, the Cluster Information page is not part of the pool setup process. From the NSSMU main menu, select Volumes to go to the Volumes Management page. Create a volume on the pool. In a web browser, open OES Remote Manager for the server, then log in as the root user. In OES Remote Manager, disable the NCP/NSS Bindings for the NSS volume you created in Step 8. For instructions, see Section 10.5.1, Disabling the NCP/NSS Bindings for an NSS Volume. The NSS volume is removed from the list of volumes mounted in NCP. However, if you exit OES Remote Manager and check the volume in NSSMU, you can see that it is still mounted by NSS. At a command prompt, launch NSSMU. In the NSSMU main menu, select Devices. Select the device that contains the secondary NSS pool and volume, then press F6 to mark the device as Shareable for Clustering. This automatically changes the share status of all pools on the device to Shareable for Clustering. In NSSMU, select Pools from the main menu. Verify that the share status of the pool is Shareable for Clustering. Continue with Section 15.5.4, Adding Commands for the Secondary Shared Pool and Volume to the Primary Pool Cluster Resource. Initially, you have a load, unload, and monitor script for the primary pool cluster resource. You modify these scripts to also manage the secondary shared pool and volume so that the NSS volumes in the DST shadow volume pair can fail over or be cluster migrated together. In iManager, dismount the secondary volume and deactivate the shared pool. Click the Object browser, then locate and select the server where the secondary pool is active. Select the secondary volume, then click Dismount. Select the secondary pool, then click Deactivate. Offline the primary cluster resource. On the Cluster Manager page, select the check box next to the resource. Click the name link of the primary pool cluster resource to view its Cluster Pool Properties page, then click the Scripts tab. On the Scripts > Load Script page, modify the load script for the primary cluster resource. Use the following sample load script as a guide for where to add the lines for each of the items. Add a line before the primary pool activation that will activate the secondary pool. (Optional) Add a sleep command after the pool activation commands to allow both pools time to be activated before you mount the shadow volume pair. Vary the time (in seconds) according to what is needed for your system. Comment out (or remove) the individual mount command for the primary NSS volume by placing a pound sign (#) at the beginning of the line. Add the mount command for the shadow volume to the primary load script. (Optional) If you are using shadowfs to provide the merged file tree view for SMB/CIFS users or for Linux services like rsync, you must allow time in the load script after mounting the shadow volume to allow shadowfs to become active before continuing. IMPORTANT:Do not perform this step if you are using Novell CIFS to provide access to CIFS users. Add a sleep 10 command after mount command, and vary it manually until it allows sufficient wait time for shadowfs to start. Add a script that varies the wait time by checking to ensure that shadowfs is started. The changes to the script do not take effect until the cluster resource is taken offline and brought online. On the Scripts > Unload Script page, modify the unload script for the primary cluster resource. Use the following sample unload script as a guide for where to add the lines for each of the items. If you use shadowfs to provide a merged file tree view to Samba users or for Linux file protocols, you must unmount the FUSE-mounted file systems that are displayed in the /media/shadowfs/VOLUME directory. Add the following command to dismount the secondary pool after the command to dismount the primary pool. On the Scripts > Monitor Script page, modify the monitor script for the primary cluster resource. Use the following sample monitor script as a guide for where to add the lines for each of the items. Add a command to check the status of the secondary pool. Do not add a check for the secondary volume. The changes do not take effect until the shadow volume cluster resource is brought online. Click OK to save all your changes and return to the Cluster Manager page. Online the primary pool cluster resource. On the Cluster Manager page, select the check box next to the primary cluster resource, then click Online. Verify that the primary cluster resource is running by going to the Cluster Manager page. The primary cluster resource is Running. On the first node in the cluster, log in to OES Remote Manager for Linux as the root user. 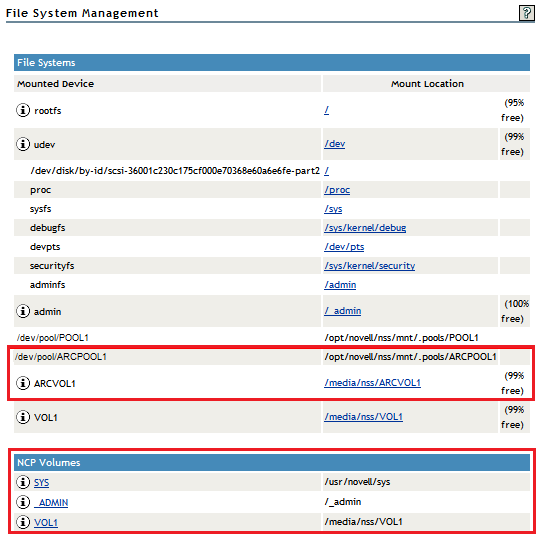 Select View File System, then verify that the secondary pool ARCPOOL1 and the NSS volume ARCVOL1 are listed under File Systems, but the secondary NSS volume is not listed under NCP Volumes. Select View File System > Dynamic Storage Technology Options, then verify that the primary volume is listed under Volume Information, and that its status is Shadowed. Select Manage NCP Services > Manage Shares, click NCP/NSS bindings, then verify that the NCP Accessible parameter is turned off for the secondary volume, and turned on for the primary volume. You can also look for the EXCLUDE_VOLUME entry in the /etc/opt/novell/ncp2nss.conf file. Continue with Section 15.7, Configuring Shadow Volume Policies for the Clustered DST Volume Pair.